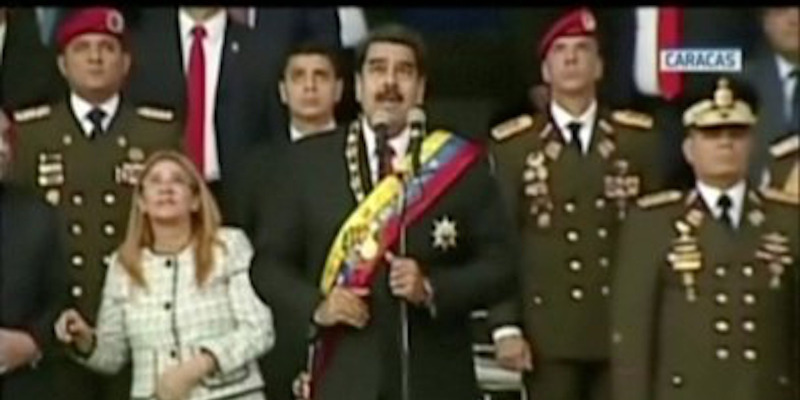 An explosion was heard and soldiers fled during a military celebration in Caracas, Venezuela, on Saturday, when President Nicholas Maduro was addressing the crowd. The administration claimed that it was a failed assassination attempt, and says that it has arrested six people and is hunting more. Those arrested have shown anti-government sentiment before, with one taking part in the 2014 anti-government protests as the country’s economic crisis worsened. Experts warn that the socialist president, whose crisis-ridden country is facing severe food shortages, will use the incident to consolidate power. He has blamed the “ultra-right” in Venezuela as well as US citizens in Florida and the President of Colombia, but both countries have denied that their governments were involved in the attack. Maduro promised “maximum punishment” and “no forgiveness” when speaking after the apparent attack. Six people who have previously expressed anti-government sentiment have been detained as the police hunt for others behind what Venezuela’s government say called a failed attempt to assassinate President Nicholas Maduro with an drone explosives-laden during a military celebration. Venezuela’s government said that those arrested have shown anti-government sentiment in the past. Interior Minister Nestor Reverol said that two of those arrested had previous run-ins with the government, but did not name them. Another, he said, took part in the 2014 anti-government protests as its economic crisis worsened. Another had a warrant out for his arrest after participating in an attack on a military barracks. Maduro and his administration have blamed the “ultra-right” in Venezuela, US citizens in Florida and the Colombian President Juan Manuel Santos for what they say is the assassination attempt, but have not offered evidence for these claims. They claim that those detained had worked with other people in these countries. But reports from Venezuelan authorities have varied, with the Caracas Fire Department saying that the explosion in a nearby apartment building was a gas leak rather than from a drone. Opposition leaders have also denied involvement. Photos purporting to depict the blast show the interior of a building burning, which more resemble a gas fire than an airborne drone exploding. Trump’s national security adviser, John Bolton, said he could state “unequivocally” that there was no US government involvement, while the Colombian government also denies involvement. Investigators raided hotels and seized vehicles as they hunted the suspects, the Associated Press reports. Experts warn that the socialist president will use the incident to consolidate power as his country continues to be mired by a financial crisis and thousands flee the country. Venezuela’s inflation hit more than 40,000% in June and the country is facing severe food shortages. An explosion went off in Caracas, the capital of Venezuela, on Saturday, when Maduro was addressing soldiers as part of the National Guard’s 81st anniversary. State television was broadcasting when an explosion was heard. Maduro and his wife, Cilia Flores, were captured wincing as soldiers ran in the chaos. The interior minister said that the attack involved two drones, each packed with a kilogram (2.2 pounds) of C-4 plastic explosive. Drones cannot be seen in the broadcast footage, but witnesses told the Associated Press that they saw the drones and news channel Caracas News 24 posted footage of one of the drones exploding mid-air. Maduro was escorted from the event by bodyguards and was unharmed. While administration officials said it was an assassination attempt, Rocio San Miguel, a military expert who leads an investigative website called Control Ciudadano, told the Washington Post that it was “a security mistake” and that the military had lost control of its own drone. David Smilde, an expert on Venezuela at the Washington Office on Latin America, told the Associated Press that the incident looked like an “amateurish” attack, rather than a staged one.